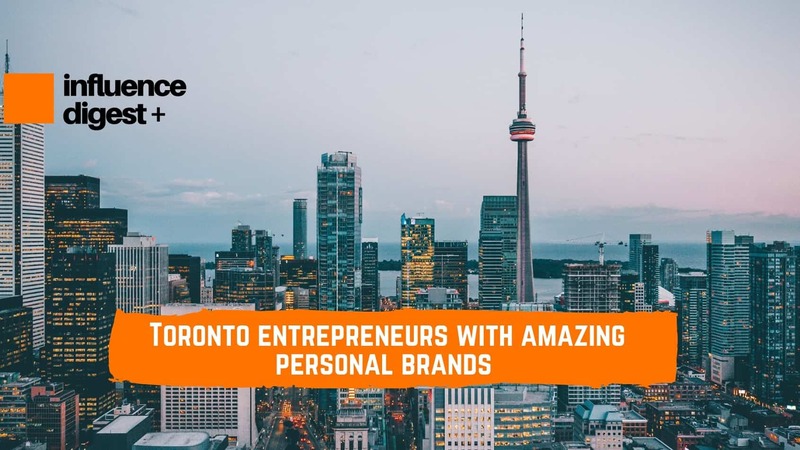 Here is a list we compiled of the Top 30 Toronto Based entrepreneurs with the best personal brands. This list includes individuals from almost every industry, profession, and recognition. Emily began her career with an event staffing agency based in Toronto; Femme Fatale. Four multimillion-dollar companies later, the young entrepreneur embarked on a new mission to further develop her personal brands. Utilizing the success of her website and on social media platforms, Emily has grown her influence and presence online. Emily provides her viewers with behind the scenes photos, quotes, and videos. Additionally, Emily is committed to advocating against sexual harassment towards females and uses various social media platforms and her personal brands to spread her message. Michele entered the tech industry when she launched Clearbanc; a merchant cash advance with a flat, fixed fee to provide better financial services for entrepreneurs. She is currently ranked among the Top 100 Most Powerful Women in Canada by the Women’s Executive Network. To further develop her brand, Michele took to traditional forms of media, such as television. She stars on CBC’s Dragons Den. Michele has also increased exposure to her own brands by through features on podcasts, lectures and keynotes events. Dani has been keynote speaking, teaching, and consulting throughout North America for the last eight years. Currently, a professor at Seneca College, Dani teaches her students about digital marketing and effective tactics for her students to replicate. Dani brings attention to her own brands through a variety of platforms. Her website provides readers with access to her social media pages and showcases her professional work. From speaking at the Globe and Mail Business Summit to running mini-campaigns for the Toronto Business Improvement Associations, Dani spends her time creating a presence in the industries she resides within. She also has the best Instagram of any professor. Ever. Mr. Wonderful goes without saying. The tech-savvy entrepreneur, who has a knack for teaching finance, built his entire empire around his personality. As a judge on CBC’s Dragons Den and ABC’s Shark Tank, the entrepreneur made his fortune running Soft Key. He now runs O’Leary Funds and Ventures. O’Leary used the popularity of his T.V. persona to kick-start his personal brands, however, the financial guru recently adapted to use social media as a marketing tool. His Instagram and Twitter account post consistently, providing viewers with behind the scenes to his television shows. In the GTA, Kevin hosts numerous conferences to teach young entrepreneurs about the art of financial success. Matty’s culinary journey began in his early childhood. Growing up on Canada’s East Coast exposed him to a variety of cuisines and some of the world’s freshest seafood ingredients. Following his passion for cooking, the young chef decided to open his first restaurant at the age of 26. Today, Matty owns several successful restaurants, with his award-winning Parts and Labour located in Toronto’s booming Parkdale neighborhood. Matty’s rise into fame started with a cooking show on the Vice- Munchies Network, hosting multiple seasons of the popular show ‘Keeping it Canada’. He is known to spend his time developing his personal brand through YouTube, Instagram, launching food books, and by featuring on The Late-Night show with Seth Myers. By targeting viewers through several mediums, Matty has cemented his presence in the culinary industry. Known as the “switch army knife digital leader”, Sean has mastered the art of driving growth, technology, innovation and culture for Fortune 500 companies. His current role as Managing Director at Wikibrands has enabled him to grow his personal brand. He has spoken in over 20+ countries and has become a digital growth champion through his marketing strategies. Sean’s personal brand flourished with the adoption of column writing for “Smart Brief on Social Media”, spearheading two Canadian networks, chairing national conferences, and commenting on national broadcast networks. The two Queens Univerity grads founded Mero Technologies- a sensor built on a platform to help empower cleaning staff to make smart restocking and cleaning decisions by bringing the Internet of Things to the restroom. Nathan and Cole have built up a strong personal brand by interviewing with several media companies such as; StartUpHereToronto. Speaking at conferences and publishing written articles on LinkedIn has also helped the entrepreneurs grown their personal brands. Jimmy entered the tech market by providing real estate agents with software capable of capturing 3-D dimensions and details about a home. These renderings could then be used by the realtors to advertise to their clients in an interesting and novel way. Jimmy developed his personal brand through Odyssey3D. In the ‘traditional’ real estate industry, he has increased his brand image through interviews and articles. Today, he has been featured in Re/MAX Canada, Century21 Canadian Real Estate, and Homelife Real Estate Canada. Hongwei’s began his journal at the University of Waterloo studying electrical engineering. As an undergraduate, the young entrepreneur founded Mappedin– a software to map large indoor areas for navigation. Today, the multimillion-dollar company crafts touchscreen for shopping malls and retail stores. Hongwei developed his personal brand by interviewing, guest speaking, and featuring on shows such as CBC’s Dragons Den. At just 21, the University dropout started networking with potential customers for his technology. He is a great example of an individual who grew their personal brand without the use of conventional social media platforms. Hongwei’s success is just one example of successful brand development through newspapers, magazines, and television shows. Nick entered the entertainment business after launching Liberty Entertainment Group. His company, located in Toronto, manages event and entertainment venues in Miami Beach and Coral Gables. Liberty Entertainment has also played an influential role in shaping the ever-growing Toronto entertainment district. Nick grew his company by staying relevant and following trends. Recently, Don Alfonso 1890, the first North American outpost of the Michelin-starred Italian restaurant, has partnered with Liberty Entertainment Group. Nick has developed his personal brand by participating in community events and high-profile construction projects. One such example is the extensive preservation and redevelopment efforts made at Toronto’s Casa Loma. The former St. Michaels College School graduate has played a tremendous role in overseeing the restoration of historic properties and assisting several Toronto mayors. Nick has developed his personal brand by updating his followers on his most recent projects on social media. Ann is the current President and CEO of IFinance Canada. The North American consumer finance company has grown to one of the largest consumer finance companies in Canada. Their loan application exceeds one billion dollars CAD. She has grown her personal brand in the last decade through features in magazines, conferences, and a role starring in The Real House Wives of Toronto. Ann has consistently won numerous awards and takes no shame dominating the spotlight. With over forty international business awards and four published books, the financial expert has used a plethora of mediums to successfully develop her professional image. These two friends call their reading app, “the YouTube of the literary world”, after developing an app with over 45 million bibliophiles. The University of Waterloo graduates gained traction on their platform after the launch of the iPhone and Kindle e-reader in 2007. They have never looked back ever since. Allen did not hesitate to explain his platform and technology to large newspaper and media companies. Companies such as Toronto Life and The Star have published comprehensive interviews with Allen on his rise to fame, growing his personal brand one article at a time. One of Mike’s early business ventures; DocSpace sold for over $530 million dollars. His current role is the Chief Executive Officer at League Inc, a digital health and wellness company. Mike’s relationship with personal branding can be traced back to his very first days in the professional business world. Since the launch of DocSpace, the tech-savvy entrepreneur has taken to media companies to discuss his work. Tech Toronto, Entrepreneur, and MaRS Discovery District have all sat down with Serbinis to elaborate on his effective capital raising strategies. Mike consistently speaks at events to raise capital and has received backing from Mike Lazaridis’s investment firm, RBC, and Manulife Financial Corp. Mike uses his expertise to teach others his formula for properly attaining strategic assets and capital. Stephen currently resides as the co-founder of Thalmic Labs and was named on Canadas Top 20 Under 20 in 2007. Thalmic Labs focuses on the development of wearable technology solutions and devices that can interact with computers. His company invented Myo, a gesture control armband. Stephen took to mainstream media to discuss his company and grow his personal brand. Through venture funding, the University of Waterloo graduate was able to receive funding from Intel and Amazon. Marie developed Sampler – a system to help cosmetic companies target individual consumers for better conversion rates. Her platform takes the guesswork out of a company’s transition into online advertising. With a passion for marketing and technology. Marie sat down with digital media companies to explain her marketing process. Reposting these personal articles and interviews on social media allowed her online presence to increase. Originally the founder of INEX, Alex spent the last 11 years developing TouchBistro, a novel system that allows servers to directly send orders from table to kitchen. After hearing the complaints from chefs and restaurant owners, TouchBistro was established and became the leading mobile POS solution. It is currently used in over 12,000 restaurants across the globe. Alex developed his personal brand through videos and guest speaking. You can find many of his lectures and interviews online in video form. Videos are a simple and convenient way to grow a personal brand because they receive a higher traction rate compared to written content. Have you ever invested using a mobile app? Chances are it was WealthSimple. The current co-founder developed the app as a way for individuals to invest from the convivence of their phone. His idea was to change the perception of investing as difficult and time-consuming. Michael promotes his company through social media outlets and has grown his personal brand by reposting financial content for his followers. He has been interviewed by large news companies, and continuously uses video interviews to explain his app. The Financial Post, Competition Bureau of Canada and Tech Toronto have each uploaded their interviews in a video format – something that drives traction and expedites personal branding growth. Joshua Liu is a practicing family physician who decided to develop an app that could help patients document their symptoms before and after surgical operations. The app can be used by doctors of all specialties and the information can be electronically shared, reducing the volume of paperwork that hospitals generate every day. The University of Toronto graduate has grown his personal brand by speaking at conferences and acting on different boards. The highly-esteemed doctor is well-known throughout the GTA and has wasted no time speaking at Michael Garron Hospital (formerly the Toronto East General Hospital) and American College of Chest Physicians. Joshua has spoken on TEDx and TechToronto in the hopes of educating users of the platform. At the young age of 23, Matthew is currently well on his way to developing a billion-dollar brand. His company, Freshii sought to make fresh food convenient. The company is scaling at an alarming rate, expanding faster than companies such as McDonald’s, Starbucks, and Subway. Matthew grew his brand by emphasizing the importance of consuming natural foods and embarking on a mission to improve the way people eat around the world. His preferred platform of communication is through interviews; however, the young entrepreneur has grown his personal brand through keynote speaking and social media. Sarah is a designer and television personality who began her career as a prop stylist. She has hosted multiple television shows such as Sarah’s House, and currently runs her company, Sarah Richardson Designs, which provides consumers with top-level home textiles and other homestyle products. Sarah meticulously developed her personal brand by excelling as a T.V. host and providing deep insight into the interior design industry. Her audience grew larger as she was able to develop realistic designs, publish books, and release many product lines. Despite a growing presence on social media platforms, the television star used traditional forms of media to grow an audience. Sarah is the founder of Future Design School; a company she founded out of a passion for making the world a smarter place. Her company supports future-ready skill development through project-based learning and deep inquiry. Through social media, the skillful entrepreneur has grown her following to over 25 thousand followers. She consistently posts quotes, articles, and photos to educate her viewers and inspire them to support her vision. Her powerful message has gained traction online over the past few years with large corporations seeking out partnerships with her mission. The Lebanese-born Canadian immigrant wasted no time in Canada developing Paramount Fine Foods into a household name. With over 80 locations, Mohamad has developed the fastest-growing Middle-Eastern food chain in Canada. Mohamad has taken to social media to further develop his personal brand. With over 80,000 followers, the entrepreneur values this platform to share company-related videos. Mohamad uses his background and passion for helping others as a foundation for growing his personal brands and reputation in the industry. His participation in community events has garnered Mohamad some well-deserved media attention. In 2015 his company partnered with Ryerson University for the lifeline Syrian challenge and now employs over 150 Syrian refugees. The Ryerson University graduate developed her personal brand through writing and speaking at public events. She has won numerous awards such as the Bay Street Bull Top 30 under 30 and was featured in CBC’s Top 10 Changemakers of 2017. Easy, also provides workshops, which are a great way to build a following amongst locals. Currently listed in the 25 Women of influence, Jessica is the co-founder of Eve Medical. Her idea was to provide women with a screening kit that can be self-administered at home. It can test for cervical cancer, HPV and other infections. Her personal brand growth has seen several strides over the past couple of years through her video interviews. Tech Toronto, The Prevail Project and other online media companies have published videos of her explaining her product. Evan is a believer in entrepreneurs. His success began when he sold a biotech software company at 19 and became a venture capitalist. Today he has started a movement of #believe. He has created a Youtube page with over 1.5 million subscribers who listen to his advice about motivation, efficiency, and skill sets to inherit. He has grown his brand through social media- mainly Twitter, and Youtube. Other methods include; selling books and launching his new Believe Conference in Toronto. It is aimed to help entrepreneurs attain the proper action plans for their businesses. Jeremy grew his personal brand by becoming one of the most sought-after keynote speakers in the world. He is currently the CEO of Future Festival and Trend Hunter- the worlds #1 trend firm. The experienced entrepreneur is routinely sourced by media and has appeared in The Economist, CNN, and The New York Times. Receiving awards has also helped improve his presence online. Some of the awards include; The New York Times Best Seller, and Canadas Top 40 Under 40 Award. George is known as Canadian media personality star. He has grown his personal brand through traditional television channels such as Much Music. After he hosted his own television show on CBC’s network; “The Hour”, his popularity skyrocketed. His personal brand has also grown on Twitter and Instagram. On these platforms, he has promoted his charity and public awareness campaigns. One campaign was “HipHop4Africa”, Mandela Children’s Fund Canada. he now resides as an ambassador for the United Nations (WFP). Michael is known as one of Canadas most iconic Dragons and merchants. Soon after joining First Maraton, the titan rose to become one of the head traders for the firm. The financial investor now currently enjoys co-hosting CBC’s Dragons Den. The financial wizard has developed his personal branding through several platforms: websites, consulting, television series, and interviews about his life. Each of these has given fans a glimpse into the entrepreneur’s past and like other Dragons Den hosts, Michael’s social media continues to stand as a platform of communication for his followers. We have all seen at least one skit from The Rick Mercer Report. The television show has been Canada’s go-to comedically satire series for its rants on current political issues from 2004 to 2018. Rick Mercer built is personal brand during his time on This Hour Has 22 Minutes and other similar T.V. programs. YouTube has enabled Rick to publish videos about his personal life. While working with CBC news the comedian published plenty of behind the scenes videos to share with his audience. Local charity fundraisers and public speaking also advanced his personal brand. While studying at Queens University, Sam and two other colleagues launched Property Spark. The platform allows real estate agents to optimize engagement via social media without any digital expertise. With an audience of over 300,000 people, Property Spark offers target advertisements for real estate agents that trumps Facebooks advertising software. The real estate tech guru took to social media to grow his personal brand. Sam publishes weekly blogs on his YouTube page; Stay Lit. Speaking at conferences, the Queens School of Business, and global real estate events, have also helped expedite the entrepreneurs personal brand growth. Are you Looking to Grow Your Personal Brand? The first step is to create your online identity. We have created a simple & effective template for you to craft your identity. Just click on the button below to download it.